Hello Portland! The Pemster has arrived! 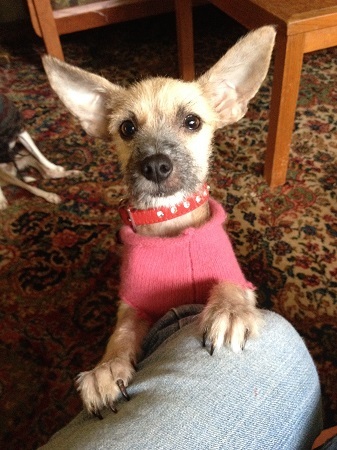 I’m a 4 1/2 months old terrier girl who is ready to rock your world! At 10 lbs I may be little, but like a ray of sunshine on a cloudy day I’ll light you up with my spunky personality! My rainbow of love knows no bounds, I’m great with kids, adults, other dogs, and would probably do well with kitties too (there will just need to be a bit of management at the beginning as we work out our relationship). I’m a smart girl who has my own opinions about things (you can ask me anything – I’m always honest, but never mean), and I like verbalize what I’m thinking so my ideal home is not an apartment. Those smarts will come in handy when we go to puppy classes together, which I will need as part of my adoption since I’m a youngin’. Whether you’re looking for a partner in crime or a bridge partner I will have your back! To come meet me please fill out an adoption application first. I am fixed, vaccinated, microchipped and potty trained. My adoption fee is $300. I am currently in foster care.